The lunar month of Esala – July/August – is the main period of religious festivals in Sri Lanka. These festivals are associated with both the Buddhist and Hindu traditions in the country and date back to ancient times. The festivals take place throughout the country with many “pereharas” or colorful processions and other captivating rituals that depict the culture of the country and its people. Jaffna peninsula has many shrines or Kovils dedicated to Hindu deities – both gods and goddesses. Among these, the Nallur kandaswamy Kovil or Nallur Murugan kovil, more commonly known as the Nallur Temple, is one of the most important Hindu shrines in the North of Sri Lanka. 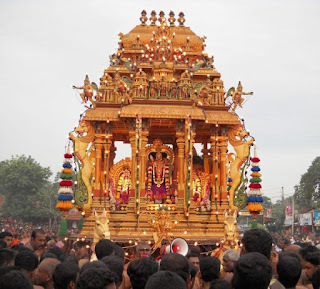 The Nallur festival stands among the longest festivals in Sri Lanka, spread over twenty-five days of traditional and vibrant chariot processions with drumming, dancing, and many acts of self-mortification held in honor of the god of war, Skanda or Murugan. Tourists are most welcome at these events as in other Sri Lankan festivals. The Nallur Festival brings out an important aspect of Sri Lankan cultural diversity, with the visitor being exposed to all the color and ceremony of the festivals in the traditions of the Hindu community of the island.